San Jose, officially the Municipality of San Jose, is a 4th class municipality and capital of the province of Dinagat Islands, Philippines. According to the 2015 census, it has a population of 27,487 people. San Jose is the seat of the Philippine Benevolent Missionaries Association (PBMA). It was once a part of the municipality of Dinagat. Even then, San Jose has been significantly progressive compared with the Poblacion until its creation as a municipality on November 15, 1989 by virtue of Republic Act No. 6769 authored by Glenda B. Ecleo, during the time of President Corazon C. Aquino. The creation was amended on December 20, 2009, an act to amend Section 1 of the above-mentioned Republic Act through Republic Act 9859 covering an area of 3,422 hectares. It was within its jurisdiction twelve (12) barangays namely; San Jose, Matingbe, Aurelio, Jacquez, San Juan, Mahayahay, Don Ruben, Justiniana Edera, Sta. Cruz, Cuarinta, Wilson and Luna. San Jose has many roads, a commercial establishment, a concrete port, a college and other urban uses not common to rural communities. San Jose is politically subdivided into 12 barangays. Philippine Benevolent Missionaries Association, "Divine Master Shrine" built for Ruben Edera Ecleo Sr. the founder of the PBMA Inc. at Aurelio, San Jose. Islander's Castle, built by the followers of Ruben E. Ecleo of Philippine Benevolent, Missionaries Association, Inc (PBMA). ^ "Province: Dinagat Islands". PSGC Interactive. Quezon City, Philippines: Philippine Statistics Authority. Retrieved 12 November 2016. ^ "Republic Act No. 6769; An Act Creating the Municipality of San Jose in the Province of Surigao del Norte". Chan Robles Virtual Law Library. 15 November 1989. Retrieved 28 January 2016. 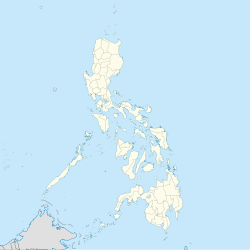 ^ "Province of Dinagat Islands". Municipality Population Data. Local Water Utilities Administration Research Division. Retrieved 17 December 2016.